All 4×4 vehicles are monster machines. Buying one with all necessary off road accessories can be expensive. However, during the last decade or two, manufacturers have granted third-parties the right to create accessories and that resulted in everyone on the market being satisfied. But, the most common question a lot of people ask is whether or not the third-party off road accessories can be a better deal and the answer is yes, more often than not. In the light of that fact, here are the most common third-party off road accessories and their detailed specifics. The most vulnerable part of any vehicle is its front because it is very open to damage from various road debris such as rocks, insects, dirt and others. For that reason, car manufacturers invented the bonnet protector. The primary purpose is to protect the front part of the car and also to keep the paint undamaged, so come a time in future the owner decides to sell it, the value of the car will be preserved. Not only that the bonnet protector offer protection, but it also adds a personality and enables things such as an advertisement in the most cost-effective way. Third-party manufacturers offer a broad range of bonnet protectors and even offer a custom design that suits their customers needs whether those are functional or aesthetic. Kut snake flares are an extension of your vehicle that are custom made and can fit your SUV, whether your vehicle is Toyota, Dodge, Chevy or some other 4×4 vehicle. Another common thing for kut shake flares is that no two units are the same. Today, manufacturers tend to create kut snake flares that are installed without drilling. However, some of them, for certain models still use the drilling method. The reason why people do not want drilling is because if the user of the vehicle decides to take off the kut snake flare, there will be holes on the car, which will surely render it not so appealing to the eye. Manufacturers sell them as a bundle of two parts – front and rear, however, some manufacturer are more flexible when it comes to replacing one damaged one, and they sell only one front or rear respectably. Currently, in Australia, there are four popular models: street style, OE style, pocket style and extended style. Each one of them has a different purpose. For instance, if you want to have an elegant look then the OE style will suit you better, the same can be said for the street style. On the other hand, if you have a bigger 4×4 vehicle then the pocket and extended style will suit you better because it offers a tougher and more rugged look. For those who have a newer 4×4 vehicle, getting through tough terrains should be easy. However, sometimes things can go wrong. Equipping the 4×4 vehicle with recovery gear is important as having a first med kit. Australia is known for having sandy, muddy and wet areas, conditions that sometimes even a 4×4 cannot handle. There are dozens of recovery gear pieces for 4×4 vehicles. However, one is a must – recovery track. This device is built with one function – to get the vehicles through tough areas. It is constructed from moulded plastic that has the necessary durability to take the weight of the vehicle. On both sides, this device has lugs, with one function to start digging into the ground on the one hand and second to create a better grip for the tires on the other. Last but not least is the roof rack. Who doesn’t need more space? Adding a roof rack to your vehicle is like expanding your house. This mechanism is one of the most affordable and reliable off road accessories that third party manufacturers offer. The installation process of the roof rack is done very easily and usually the third-party retailers offer this along with a bundle deal. Another benefit of adding a roof rack is the expansion of legroom space. The most common roof racks are: rain gutters, raised rail, flush rail and half rail. 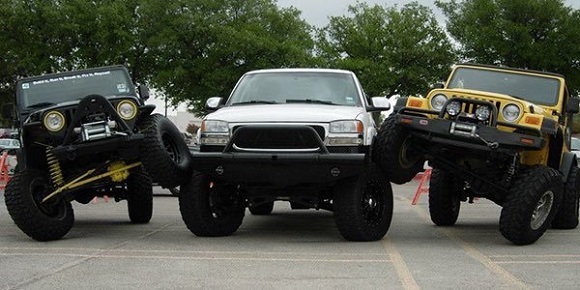 I hope that after reading this article, you gained more knowledge regarding which off-road accessory to buy and can spot the difference between an original and third-party off-road accessory.